Create a new document (Ctrl + N) 800 x 600 pixels with any color background. Set your foreground to the color #353535 and background color to #161616, then select the “Gradient” tool (G) with a radial gradient. Drag the radial gradient from the center of your canvas outwards until you have something like this. On every speedometer there are little lines which indicates the speed you are going, you can simply create these lines by using a mixture of vector masks and paths. A much easier way would be to use a circular path and the text tool. Select the “Circle” tool (U) then set the circle type to paths. Drag out a circular path in the middle of your canvas. When dragging out the path onto your canvas hold down the Shift Key on the keyboard, doing this will ensure the circle is the same size all the way around opposed to the circle looking like an ellipse. Once you’ve your happy with your circle select the “Type” tool (T). If you move your cursor over the path you will notice the cursor changing to something which resembles a line with some curvy dots running through it. Once the cursor shows up click your left mouse button to begin typing along the path. Select the font “Verdana” with a size of 12px then using the line character on the keyboard add some lines. Once you’ve added some lines select one line every 4 lines and make it bigger by changing the font size to 18px. The image below explains it a lot better. Once you’ve finished doing your lines highlight the last couple of line and turn them red. Using the techniques learned above create another circular path inside your first one but make it slightly smaller. Using the “Type” tool (T) this time add some full stops. Finally to complete the speedometer dial add your numbers and any other additional text you might want. Select the “Circle” tool (U) then on a new layer below your dial layers drag out a circle. The circle should be bigger than your dials. Once you’ve created your circle add the following layer styles. When adding the gradient overlay drag the circle on your canvas into the top left side of the “Inner Circle”. Select the “Circle” tool (U) then on a new layer underneath the “Inner Circle” layer create a bigger circle. Once you’ve created your new bigger circle add the following layer styles. Select the “Circle” tool (U) then create a small circle inside of your speedometer. Re-select the “Circle” tool (U) and create a small white (#ffffff) circle inside of the speedometer needle circle, once you’ve created the circle set the opacity to 5%. Select the “Circle” tool (U) then create a small circle inside of your speedometer needle circle. Now select the pen tool, once selected change the type to “Paths” then select “Add To Shape Area”. Zoom into your circle, select the vector mask inside of the layers window for that circle then draw the needle starting from the side of the circle. Once you’ve created the needle add the following layer styles. Your needle should now look something like this. In the last a final step I’m going to show you how to add some reflections to the speedometer, firstly select the “Polygonal Lasso” tool (L). Once selected make a selection across the speedometer like the image below. Fill (G) the selection with the color white (#ffffff) then load a selection around your speedometer “Inner Circle”. To quickly load a selection around an object simply click the little thumbnail in the layers window whilst holding down the Ctrl key on the keyboard. Alternatively you can select it from the menu, “Select > Load Selection”. Now go to “Select > Inverse” (Ctrl + Shift + I) then hit the delete key on the keyboard. You should be left with a shape which sits inside your speedometer inner circle. Select the “Polygonal Lasso” tool (L) again then make a selection in the middle of the white shape. Once your happy with the selection hit the delete key. Next, add a gradient overlay to your white shape using the default settings then set the opacity to 5%. You should be left with something like this. Were now going to add a big light reflection to the rim of the speedometer “Outer Circle”. Select the “Elliptical Marquee” tool (M) then make an ellipse in the top left side of the speedometer outer circle. Fill (G) the ellipse with the color white (#ffffff). Now go to “Edit > Transform > Warp”, from the warp menu select arc. Once you’ve selected arc from the menu drag the anchor point at bend the ellipse, then “Free Transform” (Ctrl + T) and rotate the ellipse so it follows the curve of the outer circle. Now guassian blur the ellipse by going to “Filter > Blur > Guassian Blur”, blur by about 3-4 pixels. Once you’ve blurred the ellipse set the opacity to about 70%. That’s it you’ve completed the tutorial, hope you enjoyed enjoyed it. You could now take it one step further and add a rev counter using the same techniques you’ve learned or maybe add some more dash boards items like the little glowing symbols or even a fuel gauge. I have request: can you add tutorial about design card visit ? Great tutorial, <3 this site..
Really nice and easy, thank you! Nice tips, really worth reading it, I liked it to the core , thanks!!.. Excellent tutorial, thanks a lot! So easy and so nice. But in the step when you draw the needle you have repeated one picture twice. I mean, there are two pictures for Drop Shadow effect, and no one for Inner Shadow. Very nice tutorial,I will give it a try. Thanks. This was a fun tutorial! Thanks. You are a genius indeed,want to be like u. Thanks for this tutorial, I used it to help with my new (freeware) game Cruise Racing for PC. I teach photoshop graphics at a high school in California. 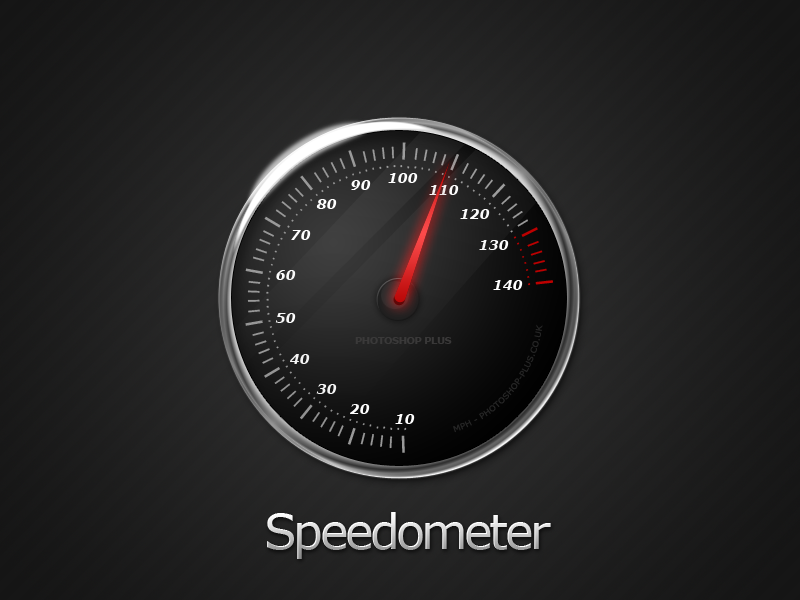 I have been using this speedometer tutorial in class for several years. Unfortunately, when my students visit this site to follow the tutorial, the images in the steps are no longer visible. Can this be remedied? Hi Ken: This is fixed now. Thanks for your patience.